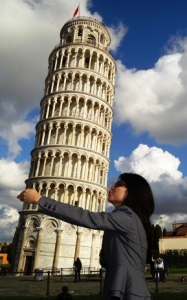 It’s time to check in on our exciting Bella Italia Photo Contest now that entries have doubled in just a month! If you haven’t already, you can see the more than 100 entries on our Facebook page and cast your vote for the one you feel is the best image of Italy. Voters may vote for multiple entries, but only one (1) vote per person (or in other words per Facebook account) will be allowed per entry during the Voting Period. 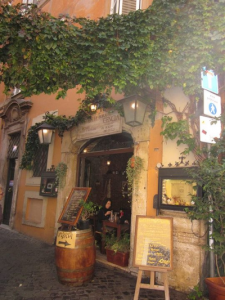 The entry leading the votes right now with 544 votes is this beautiful photo by Rose of Weston, CT she titles, “Lunchtime in charming Trastevere.” Doesn’t this make you want to go and see inside? 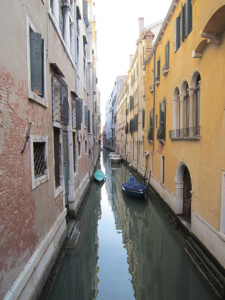 In third place with 221 votes is this gorgeous photo of Venice submitted by Leanne of Fort Saskatchewan, Canada. She calls it Pure Beauty in Venice and we have to agree. This next notable entry is one of the few in black and white, which at 174 votes may not have as many votes as the others but definitely has captured the imagine of viewers and prompted them to leave comments. Take a look at this photograph of Lucca after Lunch submitted by Sarah of London, Ontario, Canada. Many people have commented on the composition and beauty of this snapshot of Italy, including Vicky Porter of Grand Valley State University who says, “Beautiful photograph…wish I was there!” Anyone else agree? There are several new entries since our last update and it was hard to pick only a few to share. 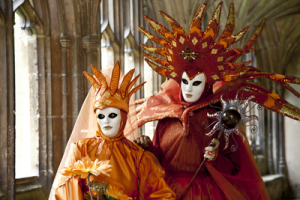 Check out this striking photo with two votes titled Venetian Carnival submitted by Christine of Southampton, England. 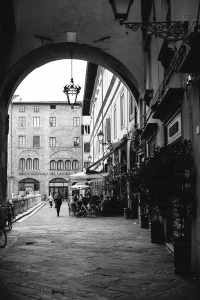 Voting on the Bella Italia Photo Contest runs until March 1, 2013. The Avventure Bellissime team will choose winners from the top 10 most-voted entries. The Grand Prize is the Essence of Italy Vacation Package from Avventure Bellissime. This package includes seven nights at selected 4-star hotels (in Rome, the Capo d’Africa, in Florence, the Kraft, and in Venice, the Ca’dei Conti) with full buffet breakfasts, five private/group transfers, two First Class train tickets from Rome to Florence and then from Florence to Venice (including transportation by car from hotel to train station and transfer from station to hotel upon arrival at next destination). The Vatican & Sistine Chapel Small Group Tour, the Colosseum & Ancient Rome Small Group Tour, Florence & David Small Group Walking Tours, Grand Canal Boat Small Group Tours, Venice & St. Marks Small Group Walking Tours, and the 35-minute Small Group Venice Gondola Ride are also included. Note: Transportation (airfare) to and from Rome is not included. Like or similar hotels may be substituted depending upon availability. The Grand Prize can be redeemed between May 2013 and October 2013. Click to see further details on the Essence of Italy Vacation Package. Three runner-up prizes will also be awarded and include a voucher (valid for 24-months from the date of the close of the contest) for an Avventure Bellissime Original Group Walking Tour of Venice. If you’re inspired to enter your favourite photograph in the contest, it’s easy to do. To enter on Facebook, simply “like” our page and then click on the Bella Italia contest tab. From there it’s easy to upload a photo you’ve taken or for which you own copyright – just be sure to include where you took the photograph in your caption information. Alternately you may share your entry via Twitter or Instagram using hashtag #BellaItaliaAB. Entries are accepted between November 5, 2012 and March 1, 2013. Please note photos may take up to 24 hours to post. You are welcome to let all your friends on Facebook know to vote for your photograph. It will be interesting to see what transpires over the next few weeks as voting intensifies and entrants share their entries with their friends and family to garner more votes because with the endless possibilities of the internet you never know who will be able to rally the most votes – and how quickly. 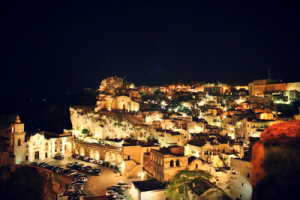 Enter, vote for or just browse through the beauty of Italy….here at Bella Italia!